seven years as a chaplain in the Marines — as well as a teacher and coach. Just last spring, he celebrated his 30th jubilee as a priest. Fr. 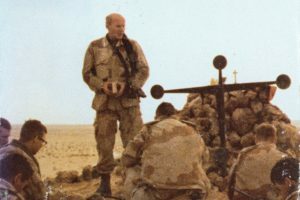 Dan Hall served as a chaplain with the Marines. Now, Fr. Daniel Hall, CSV, adds another feather to his cap: Provincial Superior of Viatorians in this country and in Colombia. His election came after Fr. Mick Egan — former provincial — was elected Superior General in July. Consequently, for the last four months, Fr. Hall had been serving as acting provincial, but his confreres made it official in an election steeped in tradition. Fr. Mark Francis, left, and Br. Michael Gosch, right, were elected to serve with Fr. Hall on the Provincial Council. At the same time, they elected Br. Michael Gosch and Fr. Mark Francis to serve with Fr. Hall on his Provincial Council. Two more councilors will be appointed, but together they make decisions that lead the community. Over the course of his more than 35 years as a Viatorian, Fr. 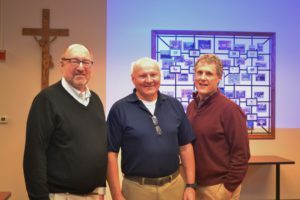 Hall has served as a deacon at Maternity BVM Parish in Bourbonnais, as well as a teacher, coach and counselor at Bishop Gorman High School in Las Vegas. He also helped to bring the Viatorian charism to Belize in 1998, when he and now Bishop Christopher Glancy, CSV, served at St. Francis Xavier Parish in Corozal. Fr. Dan Hall coached special teams for Saint Viator High School, shown here with Br. Peter Lamick, center. However, the bulk of Fr. 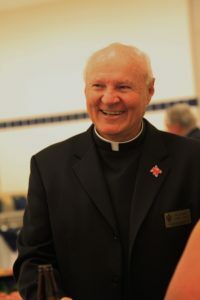 Hall’s ministry has been spent at Saint Viator High School, where he currently serves as Vice President of Mission and Identity, while also teaching social studies classes and coaching football and wrestling. 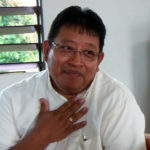 All of these experiences he now brings to his new leadership role, where he is charged with being the first superior and pastor of the province, working to promote the spiritual life of Viatorians and the communities where they serve.